Michel Jacob was born in Strasbourg, Alsace in France. He began his professional training at the prestigious Ecole Hoteliere in Strasbourg and graduated from it after three years. He then did one year’s post-graduate work at Restaurant Aux Armes de France in Colmar. In furtherance of his career he moved to Switzerland as Chef de Partie for at Hotel Intercontinental in Lausanne and Ashford Castle Hotel in Cong, Ireland. Chef Michel emigrated to Montreal in 1977 and was Sous Chef with Restaurant Le Petit Havre and held the same position at the Four Seasons Hotel. Moving to Vancouver, the young enthusiastic Chef quickly fell in love with this city, and more importantly fell in love with his future wife, Helene. The enfant Crocodile takes it’s first step in Vancouver. Le Crocodile quickly became a fixture on Vancouver dining scene, regularly pulling in honours from local critics, readers, and diners polls. 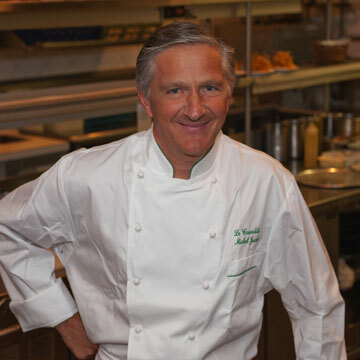 Chef Michel further accolades include being Knighted by the French Government at the French Consulate in Vancouver, a Lifetime Achievement Award from Vancouver Magazine and Inducted into the Restaurant Hall of Fame. The hall mark of unswerving consistency.